while we help build it." and our MOST CURRENT NEWS on LinkedIn. Expertise looked at 123 architects serving Albuquerque and picked the top 19.
their campuses with good design and great project satisfaction. Legacy Academy, continues to grow with expanding construction plans. throughout 2019 to see how God uses them to grow His Church! In early 2019, we celebrated the opening of the Conviction Training Center in Albuquerque. The ministry's board organized construction pro volunteers, building materials and $ donations to complete their plans 2017-2018. Since 1991, this ministry serves a mission to reach the prison system across the United States. Today, with over 39 missionaries, Conviction holds 581+ Bible Studies in prisons, special events in churches and schools, while sharing thousands of CDs for worship, writing correspondence programs and discipleship training for the cause of Christ. When those 2016 monsoon showers came down in ABQ, the service guests of Larry H. Miller's American Toyota enjoyed the new and improved COVERED ENTRY. Simons Architecture has completed many auto dealership and repair service projects over our 20+ years of commercial architecture experience. This project was on schedule to drive more business to Larry H. Miller Toyota's door. If bringing more business through your door drives you, then consider a COMPLIMENTARY COMMERCIAL CONSULTATION with the experts of Simons Architecture. Passers-by on Montgomery Blvd. in ABQ have remarked, "Have you seen the new church recently built?" The addition of a new courtyard, wall, cross, landscaping and a high-tech sign made the aging 20th century First Christian Church the talk of this part of town. A more than cleaver design of the exterior walls gives this remodel and addition project lots of 2nd looks. More impressive, this 21st century exterior wraps nicely to blend with the original building components, like the bell tower. The interior offers many 21st century treats too, especially for the kids at the playground. For churches seeking a new grasp on their look, as well as the the hearts and minds of the community, consider a FREE REMODEL CONSULTATION with your architect. LOOKING FOR A YUMMY BEACH DESTINATION IN ABQ? The Jersey Shore reaches Albuquerque in many locations. Yes, JERSEY MIKE'S is finally here! to help design and open restaurants across the USA. 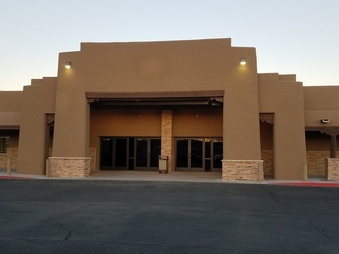 This image is the ABQ San Mateo location. See what's NEW with Jersey Mike's by slipping on your favorite flip flops for the coolest sub in town and visiting the many ABQ and Rio Rancho locations designed by Simons Architecture! Simons Architecture and the Simons Family visited New City for worship in their new space. What a blessing to see their design plans completed with such cool interior finishes. Joe Simons shares a moment with Pastor in the New City Cafe as their architect and friend. See more images of the new NEW CITY CHURCH on our worship page. TAKE ON THE ROCK & SERVE OTHERS! 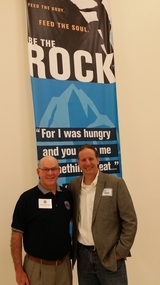 The Rock at Noon Day serves in their new building, 2500 Second St. NW in Albuquerque, to offer more meals to those in need. With Simons Architeture and the many Volunteers, Staff and Donations of Noon Day, the new space offers over 400 servings per meal, worship, laundry, clothing and social services to our neighbors in need. building plans designed by Simons Architecture. See more images of Shepherd's beautiful campus. Sandia Vision is the sharpest site in town to see and be seen! 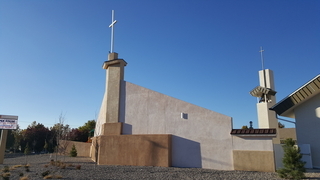 Simons Architecture PC and the Simons family were honored to worship and rededicate the Mount Olive Missionary Baptist Church, in Albuquerque since 1898, with Rev. Michael Sumbry, Pastor, the Church Staff, Board of Trustees and Families of Mount Olive Baptist. Bishop J.L. Keith Jones, Pastor of Metro Church – Church of God in Christ and the Metro Church family joined the celebration as special guests to offer an inspirational message and with encouraging praise and worship music. “Keep On… Keeping On!” was our prayer and agreement with God to rededicate this space and its servant hearts, as the Lord continues growing and blessing His church to serve Him and our community! “Simons Architecture feels most blessed when we see this architecture practice being used to further His Kingdom,” says Joe Simons, architect for the Mount Olive Baptist building projects. After a devastating fire, Simons Architecture quickly designed the new Moline Christian Church. Joe Simons joined church leadership at the grand opening to celebrate the building reopening, while remembering his Uncle during the Memorial for Rev. John Foust, former church pastor. The Church was organized in 1882. First building erected in 1886. Basement added in 1923. Destroyed by fire from lightening storm on June 15, 2012. A new church designed by Simons Architecture in fall 2012. Construction in 2013. Dedicated June 16, 2013. HEAR JOE SIMONS' RADIO INTERVIEW on his testimony, Simons Architecture and serving the community. If you missed it live... click and hear it below.